If you didn’t have authority, how would you hold people accountable? Don’t demand what must be given. Short-sighted leaders rely on authority to overcome resistance. 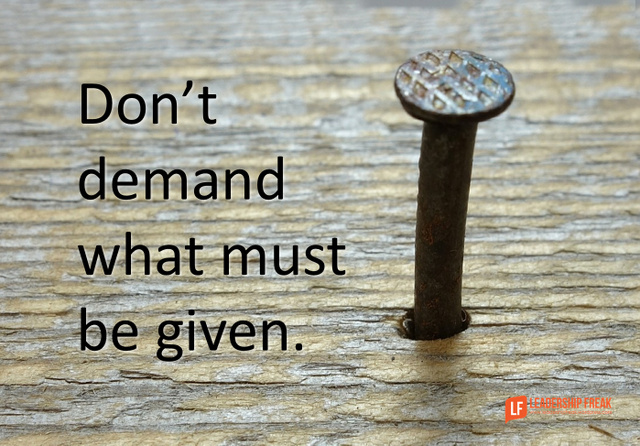 What’s the value of pressuring your team to do what they aren’t committed to do? Accountability isn’t the cure for low commitment, it’s an expression of high commitment. Forced accountability costs more than it’s worth. Pressuring people to do what you want, but they don’t want. Resorting to authority when you encounter resistance. True accountability is self-imposed. No one can do it for you. Explore commitment when accountability is low. Accountability only works when people share commitments. The uncommitted can be coerced, but they don’t feel accountable. Ask resistant team members, “On a scale of 1 to 10 how committed are you to …. ?” When the number is less than “7”, failure is about commitment, not accountability. Agree upon structures of accountability, don’t impose them. My coaching clients often establish their own accountability. They design a set of questions that I ask them at the beginning of coaching sessions. Describe the big picture and explore the path forward. Accountability requires purpose. Don’t make people accountable. Create environments where people establish and embrace their own accountability. Pushing invites resistance. You can’t push people into accountability. They may conform, if you have authority, but their fire goes out. How might leaders build accountability into organizations? Leaders in many organizations proclaim that “people need to be held accountable”. The question that resounds back is “accountable to what and to whose goals”? Dan, your emphasis on commitment is excellent. If people do not have a personal, “skin in the game”, commitment, calls for greater accountability falls on deaf ears. Forced compliance kills the spirit and quenches the fire. Thanks McSteve. Wonderful addition to the conversation. It helps to know the object of accountability. I second this question – would love to see a few examples! I’m curious what your coaching clients’ accountability questions look like; can you share an example? Whoops! I meant to reply to traybaum4’s post – would love to see a few examples! Did you schedule listening meetings with key team members? What did you learn? How did you solve your need to interrupt? How is your thinking shifting? Thank you so much – very helpful! Always remember that accountability is very much like respect in that it is a two-way street. Often we end-up see the lopsidedness of both respect and accountability. It is not uncommon to see management “expecting” both without giving any. It takes leadership to level the playing field. You said a mouthful Brent. As you and I have both discussed on many occasions, the things that set good organizations apart from GREAT ones are things like accountability, trust, mutual respect, and of course integrity. However, your last sentence eludes one very important aspect of leadership. ‘IF’, your organization aspires to obtain & maintain these attributes, it must begin at the very top with an ‘All-in Mentality’! Well, hello Steve! Your train is in-fact running on the same track. The elements of leadership are so powerful! It is up to the organization that take full advantage of them. However, as we have discussed, rowing upstream can be tiring. Thanks Brent. Powerful! You remind me of the necessity of modeling the way, not pointing the way. Great post Dan. This is one of the biggest struggles in a coaching focused organization for the folks in leadership positions. Highly accountable don’t need, and shouldn’t need, someone to “hold them” accountable. That said, highly accountable people do need to understand the big picture and the purpose. When resistance shows up, and if “change” is happening it almost always will, recalling the initial intention and the purpose can help to reaffirm or “rekindle” the original commitment. We all do things that we don’t always want to do but we need to do in order to be successful. We do them because we understand they are necessary to achieve a certain goal. Continually taking the conversation back to that “big picture” or overarching goal is a great piece of advice. Great post Dan! Self accountability brought on by commitment far outshines imposed accountability brought on by confirmity any day. Reminds me of one of my favorites from you discussing confirmity and commitment. Accountability is really about personal leadership (leading self.) When purpose becomes personal, commitment (personal investment) does too – all part of true (covenant) leadership. Another great post, Dan. Thanks Ann. It’s useful to put this in the self-leadership bucket. I find the term “self-leadership” feels confusing. Being able to lead ourselves comes before leading others. Accountability is a great place to begin. Great image for today’s post. You know what though, there are days when I feel like I need that hammer to keep me moving on track at full speed. My counselor would probably say those are the days I need to give myself a break and not internally attack myself for not putting in 8 solid hours of pure productivity (which is really a type of unobtanium anyways). Thanks James. Well said. We go further with others. We need people to “hold” us accountable. If you want to get somewhere, tell someone where you are going and invite them to ask you about the journey. What comes before purpose and after accountability? Should the equation stop there?
? -> purpose -> committment -> accountability -> ? Thanks Shane. Great question. Values — purpose ??? Accountability — fulfillment??? Great response Dan. Since I root for values based leadership, I LOVED it ! Figure out what moves people on your team. What drives them? What fuels their inner fire and makes them happy and proud? That’s how you get to purpose. After accountability? Learn from failures or celebrate success! Great post, Dan! I enjoyed your discussion on the correlation of accountability and commitment. Accountability is a tool to help us achieve the goals that we desire. If we do not desire the goals, then accountability is not useful but imposed. Our society values the individual and personal opinion very highly, and it has made these a driving force behind commitment. However, in other countries (cultures) personal opinion is not as important, as it relates to commitment. For some cultures (as where I am from), commitment to a project/activity is more based on their commitment to their leader. Accountability is then used both ways: commitment to the leader and commitment to the project/activity. However, the commitment to their leader is weak when it is only imposed, but it is strong when it is imposed and desired (i.e. a good boss). Sometimes having a strong commitment toward leadership only can be detrimental if the project/activity is detrimental to others. Conversely, commitment to an activity/project only (with low commitment to the leader) can create chaos in decision making and implementation. How can we achieve a healthy balance in this regard? I believe both commitment to the vision/project/activity and the person in leadership are needed. These two are forces that help enable healthy accountability. Makes me think of the term “buy-in”. Without it, those we lead have little reason to follow! Encouraging the buy-in is the challenge. If they don’t understand the decisions being made or feel part of that process, there is very little chance they will ever buy in to them. As I read over todays blog Dan I couldn’t stop thinking of how closely linked and similar accountability and integrity are. When I stop and examine what it takes to produce great organizations, teams, partnerships, and friendships, I come to but one overwhelming conclusion, ACCOUTABILITY & INTEGRITY. More and more is expected of our present day Leader. You must be a visionary, a motivator, a problem solver, etc., etc.. You must remain vigilant, from keeping pace with rapid changes in Market Trends, to solving inter-office conflict, to preparing next years business plan. Leaders must learn to maximize the 24 hours a day we are each given. So much is demanded of todays Leaders that micro-managing types have little to no chance of success. There just isn’t enough time to be looking over everyone’s shoulder to assure obligations are being met. Those who try, find that it’s ‘THIER’ obligations and commitments that suffer. Thats why accountability, integrity & trust are so important. When people build the foundation of their Leadership Philosophy on Character, accountability, trust, and integrity are more likely to abound. It starts with trust; hire the right people, appoint like-minded teammates, align yourself with confidants who think as you do. As a Leader, when you share your vision & each individuals mission give clear and concise directions along with obtainable goals that once reached are acknowledged with a sincere “ATTA-BOY”. Without accountability, trust & integrity, organizations waste precious time, effort, and often times scarce resources. People, Teams, and Organizations that lack these attributes will consistently find success difficult if not impossible to achieve. P.S. Really enjoyed seeing the ‘re-post’ of the Sean Glaze Blog, it’s one of my favorites. While reading post, I was curious to know various suggestions. It is really powerful. But the next question came to my mind- What to do when organisation start decelerating when people do not take accountability? When organisation is losing because people are resisting, what to do? What to do when do not come forward to take accountability? Why I am asking these questions is because it is quite natural for people to shift accountability. My view to the above points is that leaders should force accountability. Leaders should demand accountability. Leaders should make individual accountable for their work. Collective accountability should be dismantled. Your suggestion makes sense when there is scope for people to realise their responsibility. But when people deliberately shift accountability and loss is much bigger, strict action is only the key. In one Institute, when employees used to leave around 2.00 pm whereas they were supposed to stay up to 5 pm. New director created system to make people accountable. He installed punching machine where every employee was calculated for number of hours he spent on workplace. There was silent resistance but no one dared to resist openly. Employees also tried to complain to other trustees, but it was useless effort. The whole point about accountability is about finding out reasons for not taking accountability. And dealing with reason is the solution. But I would like to express my experience why people avoid taking accountability? There are some invisible force(people) who are conscious about finding your mistakes. They suddening start inflating and circulating it. People become fearful in future. Secondly, when mistake has cost and usually negative, people avoid accountability. The best solution that works in many organisation is top down approach. Leaders should come forward to take accountability and ask people to start new project, ventures and programs. They should remove the fear and infuse confidence. They should encourage information interaction and ensure proper and timely information flow. These steps can ensure accountability. I like your comment. As leaders, we can force people to do your will. But to be frank, I know of ‘no one’ who gives their best by being forced to do so. Anyway, I don’t believe in hammering people – people are not nails and shouldn’t be used as verbal punching bags, but I do believe in accountability. In order for the group to be successful, members have to agree (and understand) the group goal(s) and agree to their contribution/role in the project. A group leader monitors progress and holds members accountable for meeting agreed upon deadlines. But the method of holding people accountable does not have to be negative. A leader can alert a member that it appears progress is slowing down in their area and express concern that there may be a problem with meeting deadlines – followed by, “do you think there’s a problem meeting the deadline?”, “Do you need help?”, “Do you have any suggestions on how to get this project back on schedule?” All of this keeps the member accountable for meeting an agreed upon goal, but empowers them by making them part of a solution. None of us will be successful in every goal we set, However, I have found when failure is tied to a goal and not an individual, it can drive that individual to be successful that next go-round- helping to grow the individual. What you articulated so eloquently is nothing short of (Leadership 101). Nobody, , , but N O B O D Y , can do their best under an oppressive leader. I believe we all realise at an early age that finding positive ways to inspire others produces unbelievably positive results. When your words and actions convey confidence and commitment in others you empower them to excel. You can’t hold people accountable, but you can create an environment where they decide to step up and take ownership. You can give responsibility but you have to take ownership. Using authority to get things done kills relationship between managers and employees. Inspire them and make them happy with their duties is better because people do produce best result with what they love and environment too. The best form of discipline is self discipline. When you hire the right people, and give them a clear understanding of results needed to be accomplished, you can get out of their way and let them accomplish the tasks that lead to the results. You can’t walk away, but follow up should be in the form of questions regarding how the project is going. I’d add that you should be accountable to your team. There is no better way to unencourage team behavior if you don’t have their back. Great post. I fully agree with the statement that accountability cannot be forced and comes from commitment. This is so true. I lived it many times myself as a manager. Understanding this is fundamental, however you do not really tell us how to get there ! the real challenge is how to generate commitment and in my experience this can require a lot of efforts. I would have liked you to develop more this aspect. Wonderful post. Accountability cannot be forced and the use of force negatively impacts everyone. Thank you.